Last year my hubby and I thought it would be cool to spend fall and winter tucked away in the mountains. We packed up and headed to Asheville, NC for eight months. While living there I experienced some of the best food in my life! That place is a natural foodies’ paradise! We both fell in love with this little organic coffee shop down the street from us. 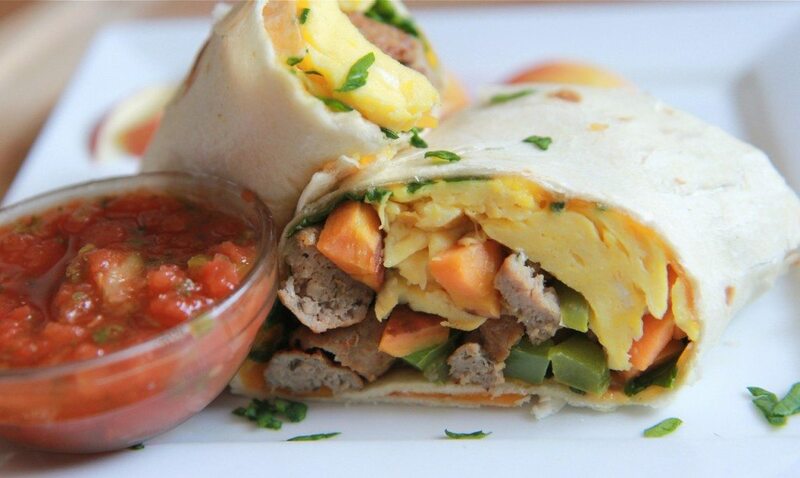 One of my husband’s favorite items on the menu was the Autumn breakfast burrito. It was huge, rustic and downright delicious!! 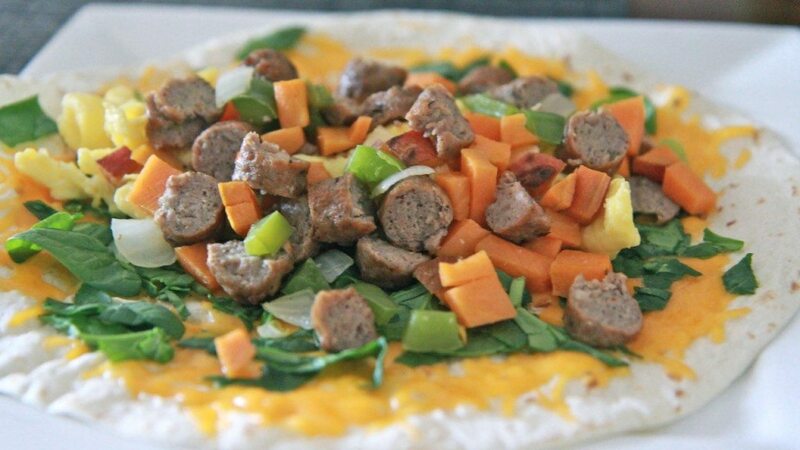 This colorful, monstrous burrito was loaded with scrambled eggs, roasted sweet potatoes, peppers, onions, fresh baby spinach, seasoned sausage and lots of cheese all wrapped in a whole wheat tortilla. Sounds delicious? It was! Whew, talk about filling and comforting! 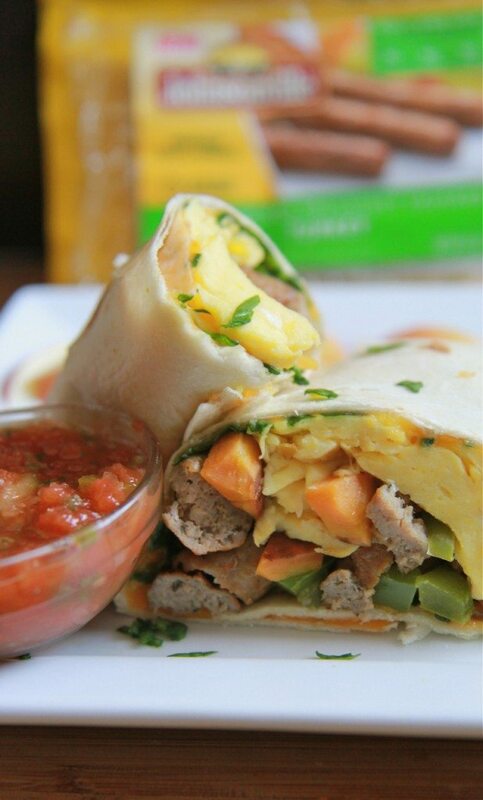 It made for the perfect healthy and portable breakfast, lunch or dinner. My husband still talks about this burrito so I thought I’d surprise him by recreating it for breakfast this week. With such simple ingredients, how hard could it be? Weeeell… after my third attempt and a few not so lady-like words, I finally got it right! Geez, sometimes the simplest recipes can be the hardest to recreate, huh? The easy part was gathering up all the fresh ingredients. Pretty straight forward stuff there. The hard part? Trying to replicate that juicy, flavorful sausage they used. This was such a key ingredient because it really perked up the flavors of the other ingredients beautifully! Finally, Johnsonville’s Turkey Fully Cooked Breakfast Sausage came to my rescue. BINGO! I’m not sure what sausage that little coffee shop used but this Johnsonville sausage was spot on, if not better! These would also taste great with the Fully Cooked Smoked Turkey Sausage Links. One thing I love about Johsonville Sausage is how doggone flavorful they are! I didn’t even have to add salt or any other seasonings. Can you believe that as much as I love seasonings and spices! I had to shoo Isaac away from the pan while the roasted filling cooled because he kept sneaking all the sausage. If you haven’t noticed, I try to stick with chicken or turkey in my house as much as possible. It’s really hard finding good breakfast sausages that don’t contain pork. You’ll appreciate these Johnsonville Smoked Turkey Sausage Links, if you’re in the same boat. They have 70% less fat and are made from premium cuts of turkey with no fillers. Winning!! (Yes I still say that.) And unlike most other fully cooked sausages, Johnsonville uses absolutely no fillers for a juicy and firm texture and bite. Now, you can certainly add in more ingredients like fresh avocado or black beans if you wish. The coffee shop served these burritos with salsa verde but I don’t think it needs a sauce at all. My husband likes it with fresh salsa and a avocado-sour cream dip. 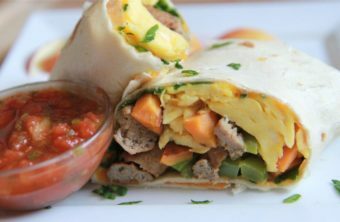 I served these Autumn breakfast burritos with fresh fruit and a grand latte. It made for an amazing breakfast fit for a busy, crisp fall morning. I don’t wanna toot my own horn here (toot toot) but we thought these tasted way better than that little coffee shop in mountains. What’s your favorite comforting fall breakfast? Leave your comment below and automatically be entered for a chance to win a $100 Visa gift card! Drizzle sweet potato, green bell pepper and onion lightly with olive oil. Place on a greased cookie sheet in a single layer. Add in sausage during the last 5 minutes to heat it. Generously grease a griddle with butter over low heat. Sprinkle cheese over the entire surface of the tortilla and allow to melt slowly. 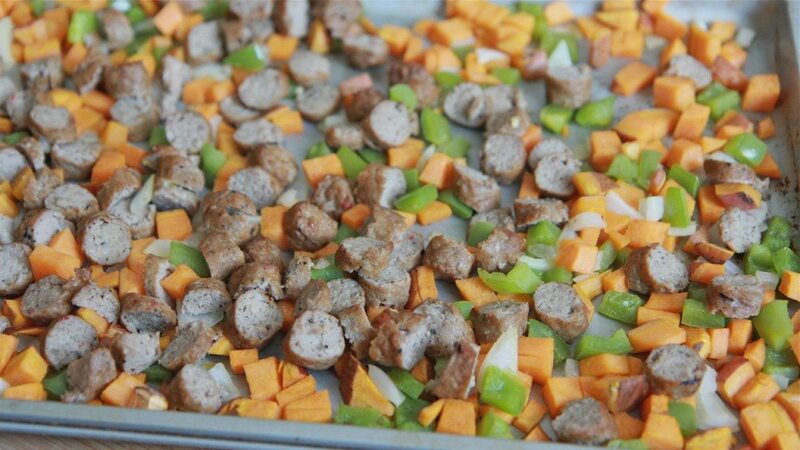 Add the sweet potato sausage mixture on top of the eggs. Transfer burrito to a cutting board or plate and roll up burrito-syle. Place seam side down. Cut at a diagonal and serve. This sweepstakes runs from 9/29-11/2. 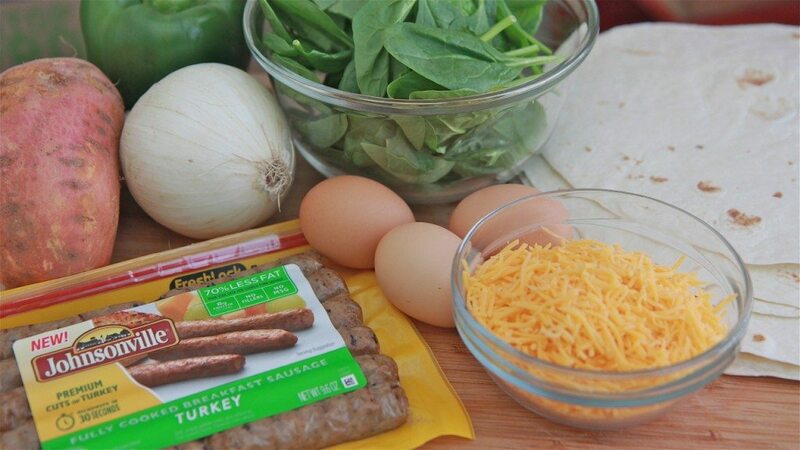 Be sure to visit the Johnsonville Sausage brand page on BlogHer.com where you can read other bloggers’ posts! Looks awesome must try it. favorite is a nice hearty omelette with sausage and potatoes in it.